On 8 May the "Transport and Environment" (T&E) federation published results of the study that confirmed expected benefits of the EU Fuel Quality Directive (FQD). The potential price differential between tar sands and conventional oil, resulting from the FQD, would shift investments from tar sands to lower-carbon oil sources, saving the planet up to 19Mt CO2 a year. This is equivalent to removing over 7 million cars from roads every year. New evidence [ http://www.transportenvironment.org/ ] on the impacts of a proposed EU law devised to cut emissions from diesel and petrol production [http://eur-lex.europa.eu/] overturns claims by the oil industry that the law would not save greenhouse gas (GHG) emissions. bon oil sources, saving the planet up to 19Mt CO2 a year. This is equivalent to removing over 7 million cars from Europe’s roads every year. The study was released in the same week that Canada’s Natural Resources Minister, Joe Oliver, pays Europe a visit to again heavily lobby against the environmental differentiation between conventional and unconventional sources of oil. Canada, whose tar sands are the world's third-largest proven reserves of oil, vociferously opposes EU’s climate action. The Fuel Quality Directive sets a target for oil companies to reduce the carbon intensity of petrol and diesel by 6% by 2020. In October 2011, the European Commission proposed the detailed rules for implementing the targets, which includes so-called ‘default values’ for the carbon intensity (based on their average extraction, processing and combustion emissions) of different sources of fossil fuels. For instance, the default value for natural bitumen, the technical name for tar sands, is 23% higher than the value given to conventional oil, because extracting crude from Canada tar sands requires more energy. The report highlights that the 19Mt CO2 savings would be additional to the 60Mt CO2 savings per year that will be the result of the FQD target in the EU by supplying low carbon fuels to the market. The study also debunks oil industry’s claim that the fuel law would put EU refineries out of business. It found that the default values would not have an impact on EU refineries simply because EU’s refining facilities are not equipped to process unconventional crudes. “The Fuel Quality Directive with these proposed carbon intensity values is a powerful incentive for oil companies to opt for lower carbon fuels. It makes perfect sense to the climate to keep those differentiating values in if we are serious about fighting global warming”, Nusa Urbancic added. Currently, Canada sends small quantities of tar sands to Europe. This could rapidly change if pipeline capacity increases, which would enable tar sands to access world markets. The most important one is the hugely controversial Keystone XL pipeline that is awaiting approval by US president Obama. Amid intense Canadian lobbying, a vote in the Technical Committee of experts of member states ended in a stalemate in February 2012. The European Commission was asked to make a full impact assessment of the law, which is expected before the summer. The total world reserves of heavy oil and bitumen are estimated at 800 billion tons, which is almost five times greater than the amount of remaining oil reserves of low and medium viscosity. The largest reserves belong to Canada (520 billion tons), followed by Venezuela with 180 billion tons. Geological reserves of highly viscous and heavy oils in Russia reach 6 to 7 billion tons. 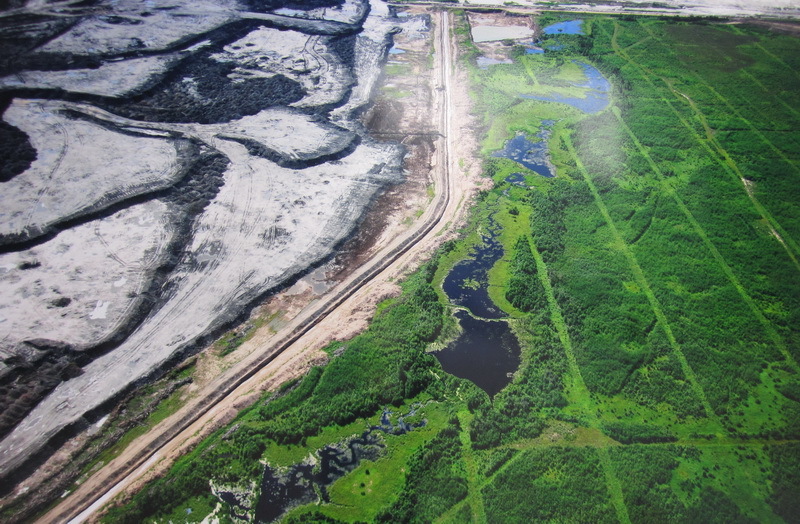 In addition to the fact that tar sands are ultra-high carbon fuels, its extraction requires extremely significant amounts of fresh water, and destroys natural landscapes over vast territories. However, the most important objection to "unconventional" oil lies in the fact that the humanity is already very close to the threshold of allowable carbon dioxide concentration in the atmosphere, after which imminent climate catastrophe will happen. Burning total reserves of “conventional” oil will bring the carbon dioxide concentration in the atmosphere above this threshold. In the beginning of May, the level of carbon dioxide in the atmosphere exceeded 400 parts per million for the first time in the history of its measurements. Such level of carbon dioxide existed on Earth about 3 to 5 million years ago. One and a half centuries ago, before the widespread use of oil, this level was equal to 280, and in 1958 – only 315.